Status: Rare casual fall migrant. Documentation: Description: 12 Aug 1979 Walgren Lake, Sheridan Co (Rosche 1982; Bray et al 1986). Taxonomy: Gill and Donsker (2017), Clements et al 2016), and Pyle (2008) consider this species monotypic, which is followed here. Several authors recognize two subspecies: nominate ridibundus, an Eurasian and local eastern North American breeder, replaced by sibiricus in eastern Siberia (Howell and Dunn 2007; Olsen and Larsson 2004). Howell and Dunn (2007) suggest sibiricus might range to Alaska. The few Nebraska records are presumed subspecies ridibundus, if recognized, but it is possible that sibiricus might occur. Fall: There are four reports, three documented, and the other seen near Venice, Douglas Co 18 Nov 1985 by an experienced observer but reported second-hand (Padelford and Padelford 1986) and thus not accepted by the NOURC. We believe this record is based on a correct identification. Comments: This Eurasian gull first bred in North America in 1977 and now breeds in low numbers in southeast Canada and the northeast United States (Olsen and Larsson 2004). It has become fairly common in recent years along the East Coast, where several thousand winter (Olsen and Larsson 2004), but remains rare on the Great Plains. 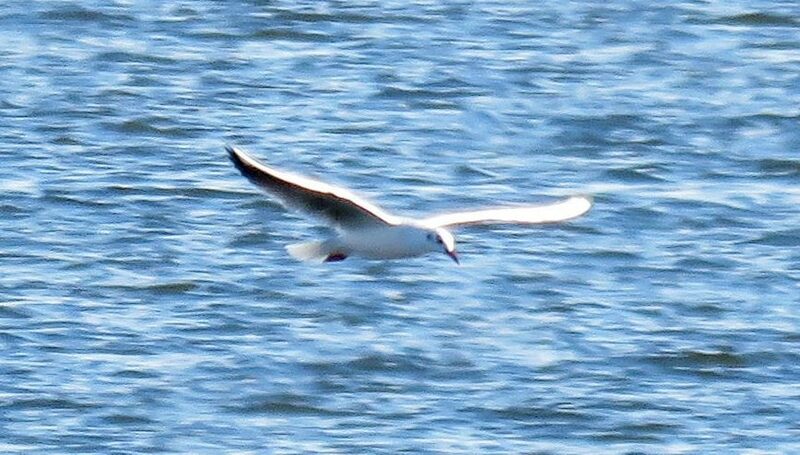 Since this species and Little Gull often occur in Nebraska with Bonaparte’s Gulls, and Bonaparte’s and Little Gulls both breed in the Hudson Bay area and generally migrate together (Olsen and Larsson 2003), it is possible that a few pairs of Black-headed Gulls travel with Little Gulls and possibly breed in the same area. There is a remarkable series of records from northwest Iowa and adjacent southwest Minnesota in the vicinity of Spirit Lake, which extends into both states. Beginning in 1986, when one was at North Heron Lake, Minnesota 28 May, reports of mostly single birds continued until 2007, when one was in the same area 10 Aug-12 Oct, and into 2016 (eBird.org, accessed December 2017). Breeding almost certainly occurred on occasion; a fresh juvenile was at Jemmerson Slough in Dickinson Co, Iowa 23 Jun 1996 (Kent and Dinsmore 1996). Dates of occurrence of the 24 or so records during this 20-year period were primarily Apr-May and Jul-Nov.
For states adjacent to Nebraska, there are some 43 records (as of Jan 2016), 24 of these from Iowa and Minnesota (see above). There are six Iowa records (Iowa Records Committee reports of Iowa rare bird records, accessed 21 February 2018) other than those discussed above, eight from Kansas (Thompson et al 2011), four from Colorado (CBRC), and one from Wyoming (Faulkner 2010). Taken together, dates of these 19 records are in the periods Mar-May and Jul-Nov. Photograph (top) of a Black-headed Gull at Branched Oak Lake, Lancaster Co 14 Nov 2015 by Michael Willison. Padelford, L., and B. Padelford. 1986. Common Black-headed Gull in Nebraska. NBR 54: 28.